New Website for Honey Hill Inn & Cabins - InsideOut Solutions, Inc.
Honey Hill Inn & Cabins sits on 12 acres in the mountains of Chandler, just 15 minutes from Asheville, North Carolina. They offer a Bed & Breakfast style Inn as well as six cozy cabins, each with a view of the breathtaking Smoky Mountains. You’ll never be bored during your stay at Honey Hill; it’s located just a short drive away from a wide variety of fun activities, such as plentiful hiking trails, whitewater rafting, shopping, sightseeing, zip-lining, and microbreweries, just to name a few! Even if you never leave the property, you can enjoy a stroll through their Butterfly Garden, relax atop Honey Hill in an Adirondack chair, or explore the 12 acres of grounds available. Steeped in history, construction on the Inn was completed in 1895 by Captain John Hoyt, a Civil War soldier. Through the years it has retained is historic charm, but has been been maintained with modern amenities. It has also been listed ion the National Register of Historic Places. The cabins were constructed later, in the 1990’s and early 2000’s. 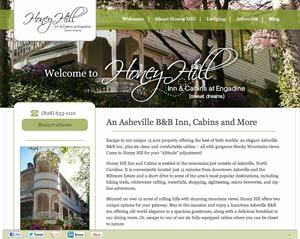 Honey Hill Inn & Cabins landed on our Level 2 Advantage plan for their site. A Level 2 plan includes a concept site, up to 10 pages, a mobile site, 3 years of hosting and domain registration, site analytics, training and support from our staff, and much more! Are you looking to provide your future customers with a fresh web experience? Contact us for a free quote!